The Multi Jet Fusion 3D Printing solution can be purchased through HP specialised partners -- starting from Rs 2.5 crore -- which includes pre- and post-processing unit, the 3D printer and initial consumables. In a bid to take the industrial manufacturing in India to a new level, printing and PC major HP Inc on Wednesday made its acclaimed Multi Jet Fusion 3D Printing solution commercially available in India. The Multi Jet Fusion 3D Printing solution can be purchased through HP specialised partners -- starting from Rs 2.5 crore -- which includes pre and post-processing unit, the 3D printer and initial consumables. "Manufacturing in India today constitutes 18 per cent of the GDP and the government is trying to push that towards 25 per cent. It is an opportune time for HP to bring its award-winning, revolutionary 3D technology to India to facilitate digital transformation of the manufacturing industry," Sumeer Chandra, Managing Director, HP Inc India, told IANS. "We are targeting mainstream manufacturing use cases in India. Initially, companies will use our 3D solutions for prototyping but eventually, it will help them make parts for real-time production," Chandra added. 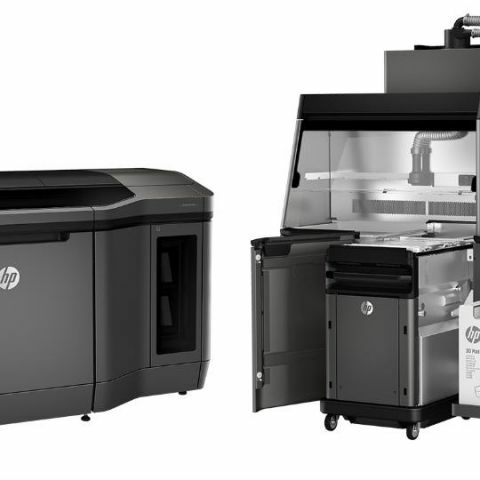 HP's Multi Jet Fusion 3D Printing solution is a production-ready commercial 3D printing system that delivers superior-quality physical parts up to 10 times faster and at half the cost of current 3D printing systems. To begin with, as a certified HP 3D printing reseller partners, Mumbai-based Imaginarium and Noida-based Adroitec will bring best-in-class expertise and knowledge of HP's Multi Jet Fusion technology to customers deploying the solutions. By scaling its business, HP continues to reinvent the $12 trillion global manufacturing market, including the $6 trillion Asia-Pacific and Japan manufacturing segment where India is a strategic hub for this significant shift. According to Alexandre Lalumiere, Director, Asia Pacific & Japan (APJ) 3D Printing, HP Inc, 3D printing or Additive Manufacturing (AM) has huge potential to replace conventional manufacturing. "3D printing is the building block that allows the digitization of production. Industry is yet to fully understand what this technology can achieve but beyond prototyping, industry is now looking at building spare parts, applications like tools, fixtures, moulds, etc. We are aiming to make 3D technology work for mass production environments and customization," Lalumiere told IANS. Currently, HP 3D printing solutions are available in Asia-Pacific, EMEA and the Americas, with more than 65 channel partners engaging with customers and more than 25 experience centres showing Multi Jet Fusion in action. "We are jubilant to be the first company to bring the HP MJF machine to India. With its revolutionary Voxel technology, the HP MJF machine will be a game changer for the Indian manufacturing sector," said Atit Kothari, Business Development-Leadership Team at Imaginarium. "This partnership will allow Adroitec to offer rapid production of functional parts to its over 6,000 customers, improving their design capabilities and offering them faster time-to-market," added Saroop Chand, Founding Director, Adroitec. With more than 500,000 high-quality, 3D-produced parts in the last year alone, HP's Jet Fusion solutions lead the industry in speed, economics, quality and reliability. According to HP CEO Dion Weisler, after producing plastic-based products, the company now aims to sell 3D printers that produce metal objects.